With Bolt, your next game or VR experience could be brought to life without writing a single line of code. 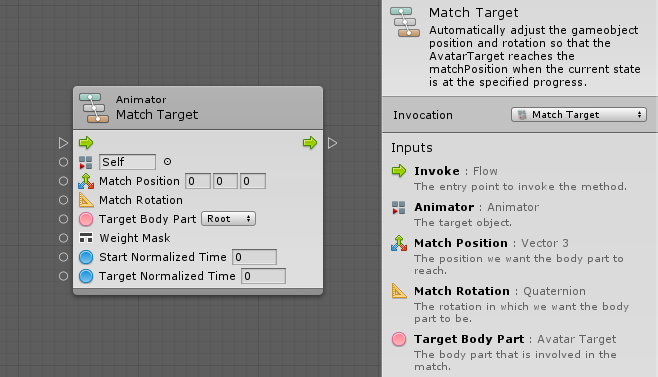 Welcome to the next generation of visual scripting in Unity. Bolt packs the two most popular graph types in a single plugin. Flow graphs start with an event and let you do everything you can think of: change properties on components, trigger actions, do logic and math, check conditions and loops, etc. They're the core of your logic. State graphs take your organization one step further, allowing you to create intelligent behaviours for your enemies, managers for your user interface and progress structures for your game. If it can be done with code, it can be done with Bolt. Action? Reaction. 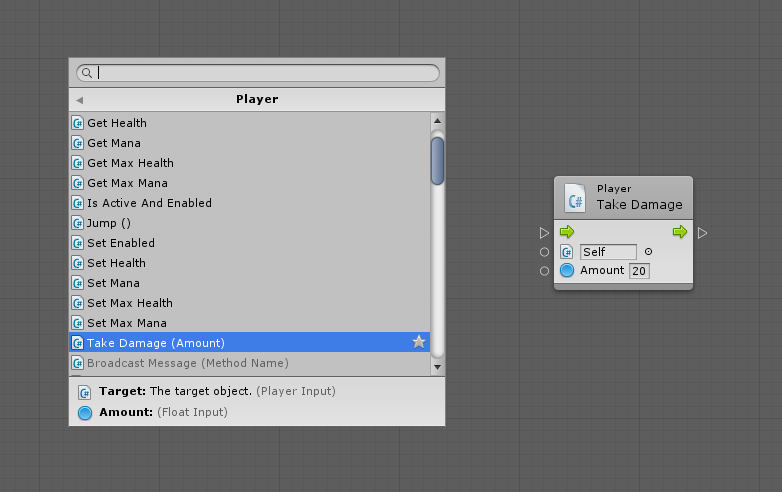 Listen to any Unity event or trigger your own custom events with any amount and type of arguments. Bolt's powerful event system allows you to communicate across objects and scenes effortlessly. Store and retrieve any kind of data in Bolt's variables. Health points, names, score, and even complex data structures. Every type is supported, not just primitives. Organize your graphs easily: with macros, you can reuse entire graphs with different parameters. 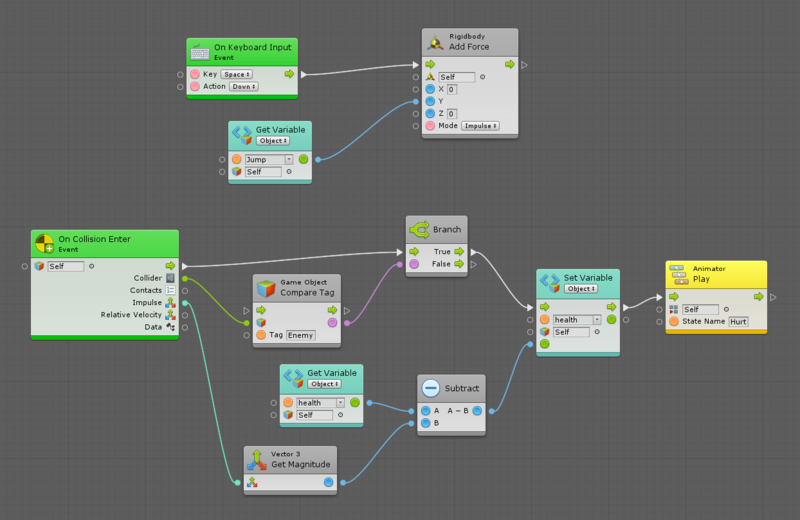 Convert your graphs into super nodes with input and output that you can then nest inside other graphs. 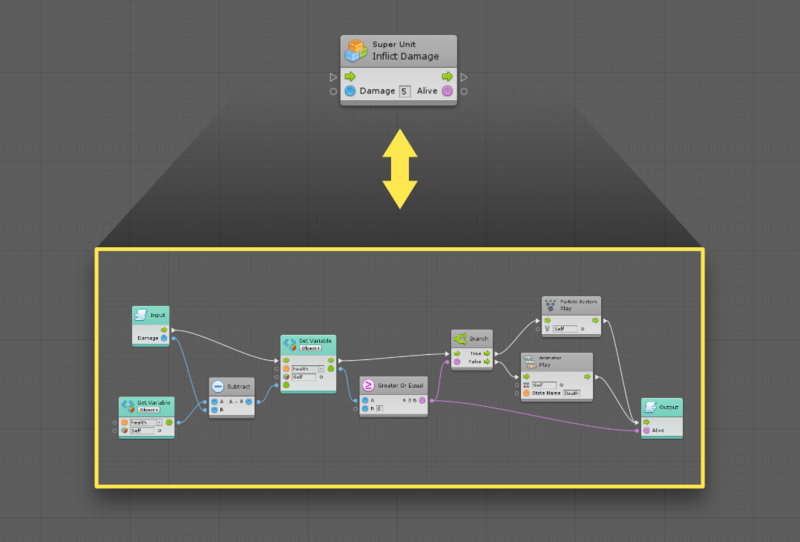 This way, your game logic remains organized and maintainable. 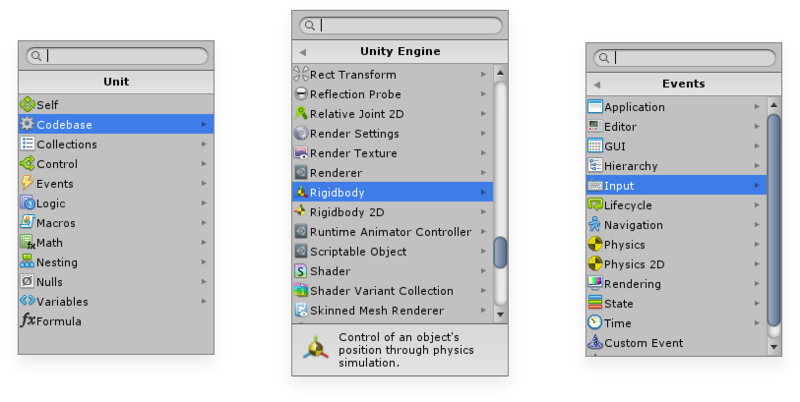 Bolt's style integrates seamlessly in the Unity editor. Cutting edge workflow tools help you create more efficiently. Press Play and let the magic happen. Press Play and let the magic happen. 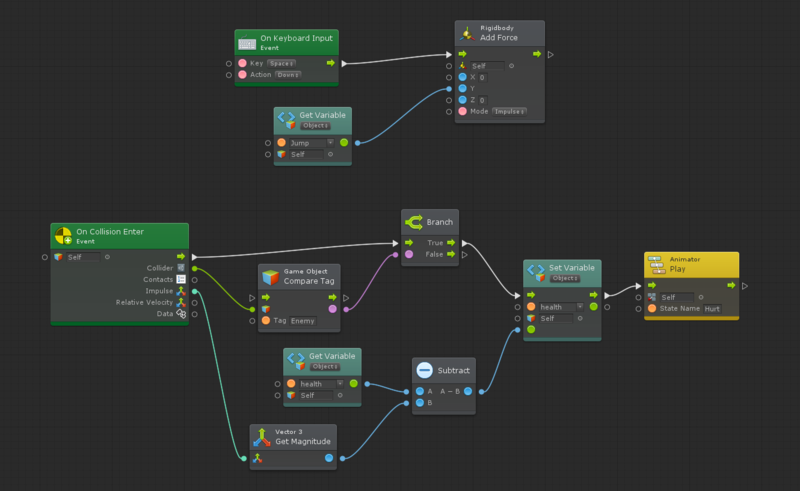 Step through the flow of your game with clear animations and indicators to understand exactly what's going on. Edit your graphs while in play mode to prototype quickly and tweak your balance. Fix most errors before you even press play. Fix most errors before you even press play. Bolt detects missing inputs, null references, missing components and unused paths while still in the editor, allowing you to spot common pitfalls and save precious testing time. No need to open the manual ever again. No need to open the manual ever again. Bolt integrates Unity, .NET and third-party documentation right in its editors so that you understand what every port does at a quick glance. Mix Bolt and C# without any limitation. Communicate to and from Bolt with ease. Communicate to and from Bolt with ease. The simple and powerful scripting API allows you to get & set variables, trigger custom events, and even create advanced custom nodes. Every MonoBehaviour is available within your graphs. Every MonoBehaviour is available within your graphs, as well as ScriptableObjects, classes and structs. 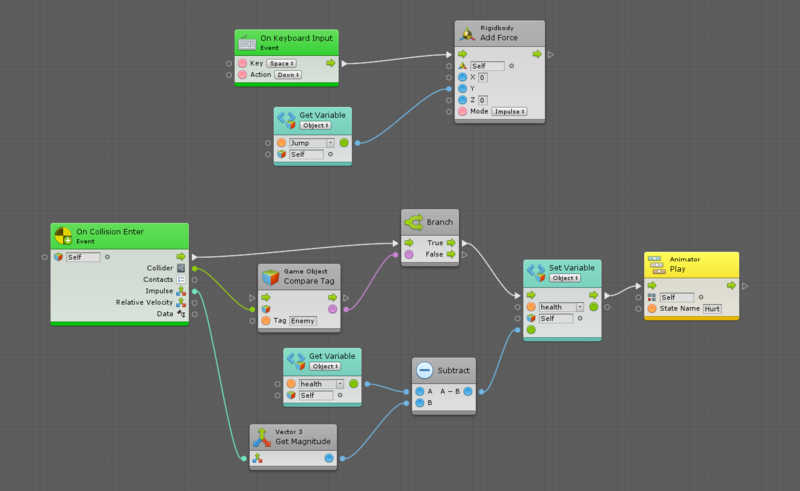 Include any type in the options wizard to use all of its methods and properties as nodes. Configure Bolt to display names the C# way. 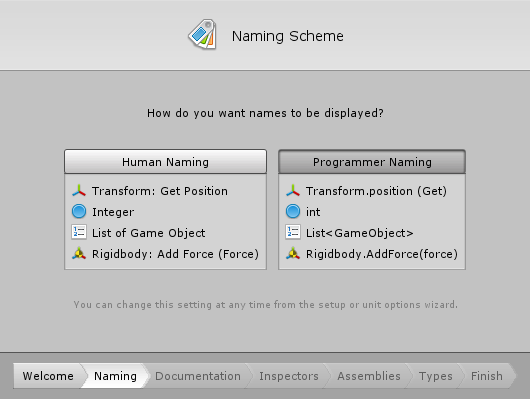 Configure Bolt to display names the C# way. With a single setting, you can display types, members, methods exactly as they are called in your script files. Bolt highlights compatible ports and filters its unit suggestions contextually. Create customizable groups to organize your nodes. Layouting tools help keep your graphs tidy. Ctrl+Z your heart away. Full editor support for undo, redo, copy, paste and duplicate. Convert complete graphs into single, reusable nodes. Super units and states can be nested at any level. Make any custom class or struct inspectable and serializable with just a few simple attributes. Bolt gracefully handles reflection failures so that you never lose any of your graph data. Use your mouse to insert variables, units and macros into your graphs. 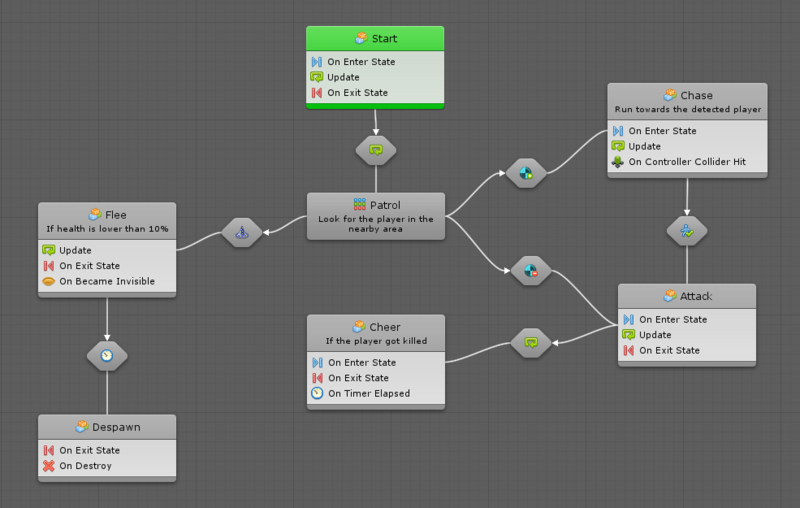 Create complex state machines that are not restricted to a single running state. Every third party plugin can automatically be analyzed and used by Bolt without any integration required. I have bought many great plugins before, but none that have potential like this one. This, to me, could very well change the game. Bolt is the difference between economy and business class. I can't recommend Bolt enough for anyone that would like to get more involved in developing game logic. I was a solid Playmaker user... I decided to give its chance to Bolt. And I'm not disappointed. Anyway, I am trying really hard to keep this review cool, informative and objective... but it's hard. Really hard. 3 weeks into bolting and Bolt turned me into a fanatic Bieber-a-like fanboy. I've spent time with Playmaker, Nottorus, Blox, and uScript - as well as doing a fair amount of C#. Bolt is the best overall experience I've had. Bolt is just perfect, the community on Discord is super helpful, the lead developer and the community manager are always here to help. When I first saw Bolt in action I could (quite literally) follow the flow of the logic, and understand what was happening and why. It really was an eye-opener for me. I have been programming for more than a decade, but I still find Bolt to be a useful addition to my workflow! The state machine system in particular, is flawless and elegant. With its capacity to bring in anything in your codebase, it's a breeze to integrate a ton of other assets and more tools from our coders. And it's just beautiful too.